Other Products by Herbs Of Gold. Search other Blood Sugar Control products. 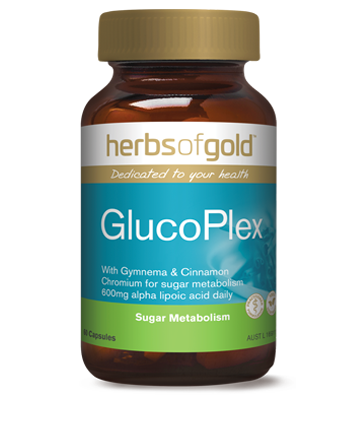 Herbs of Gold GlucoPlex contains a blend of herbal medicines and nutritients, designed to assist with healthy insulin signalling and glucose management. Given the types of foods that those living in developed nations tend to consume, it is not surprising that insulin resistance is as prevalent as it is today. Insulin is a hormone released by the β-Cells of the pancreas in response glucose, and has the important job of binding to cell receptors and triggering the release of GLUT-4, which "opens-up" a channel on the cell membrane. This allows glucose—and amino acids—to flood the cell. This can be compared to opening a door to let someone into your home. Insulin opens that door, allowing in glucose, as a guest. Because individuals in developmed nations tend to consume such a large amount of carbohydrate and sugar, this signal can become compromised, much as the hinges on a door become stressed with over-use. Furthermore, important nutrients that allow this insulin signal to function can become depleted, and the β-Cells of the pancreas can eventually become depleted and unable to synthesize enough insulin. These are all considered contributing factors to insulin resistance, which contributes to the development of type II diabetes and obesity. As you can imagine, if insulin cannot do it's job properly, blood glucose levels will stay elevated for longer. Herbs of Gold GlucoPlex contains a range of supportive nutrients and plant extracts to assist with the management of insulin resistance. Most kitchens contain a range of herbs and spices that we like to use in cooking when the recipe calls for a little more flavour. And many of these have therapeutic value. For instance, Cinnamomum cassia, a relative of the regular cinnamon that we cook with, has been demonstrated in clinical trials to reduce blood glucose levels at a statistically-significant level in type II diabetics1. Furthermore, Gymnema sylvestre leaf is an Ayurvedic herb with scientific evidence to support its use for blood sugar control and to promote regeneration of the pancreas2. Another interesting addition to Herbs of Gold GlucoPlex is Chromium Picolinate, which is a bioavailable form of chromium. Research has shown that supplementation with this mineral can reduce insulin resistance and decrease the risk of cardiovascular disease and type II diabetes3. Levels of this mineral tend to decrease with age, while dietary bioavailability tends to be low. Herbs of Gold GlucoPlex also contains Fenugreek, lipoic acid and zinc, which are all typically used for the management of insulin resistance and blood sugar irregularities. Herbs of Gold GlucoPlex is a fantastic and scientifically-validated blend of herbs and nutrients to assist with tjhe management of blood glucose levels. Interestingly, insulin is considered to be a potent anabolic hormone, as it shunts amino acids into the cell as much as it does glucose. Therefore, healthy insulin acitivity may also be useful for supporting lean body mass. Adults - Take 1 capsule, three times daily with meals or as professionally prescribed. Does not contain added milk, egg, peanut, soy or tree nut products, yeast, gluten, lactose, artificial colourings, flavourings or preservatives.